THERE was a dramatic finale to Saturday’s clash between Haslem-Sheppard Halifax AFL title contenders Ryburn United and Sowerby Bridge at Ripponden. It finished 4-4 but only after West Riding Trophy finalists Bridge had scored twice in the last three minutes. Adam Barlow and Lee Wood struck to prevent runaway leaders Ryburn from banking a valuable three points and keep fourth-placed Bridge’s outside hopes alive. Ryburn have an 11 point lead but Shelf FC have dropped two points fewer ahead of a three games per week schedule for the rest of the month. Saturday’s game took place on a heavy pitch, churned up by two junior matches in the morning, and Ryburn looked certain to prevail when they extended their 2-1 interval lead to 4-2. Their goals came from Owen Wilkinson, Ashton Richardson, Joe Swallow and Brad Waddington with their third, from Swallow, a stunning 30-yard effort which went in off the underside of the bar. However, Bridge refused to throw in the towel and added to their earlier goals from Damian Watkins and Wood. The game between Sowerby United and Sowerby Bridge was postponed and the only other top-flight game was at Mytholmroyd where Hebden Royd Red Star maintain their superb run and added to Northowram’s relegation fears. Star won for the fifth time in 22 days and strengthened their hold on third place with a 4-2 success, having won narrowly at Northowram Rec late last month. On a heavy pitch, which cut up badly as the game progressed, Star had fewer chances but took them whereas the Rams were denied by some fine goalkeeping from Richard Roberts, some resolute and last-ditch defending and their own inaccuracy in front of goal. The visitors showed application and spirit in the opening 25 minutes but fell behind to a breakaway goal form the ever-dangerous Lewis Cockroft. Two minutes later Will Chadwick headed Star’s second. The Rams continued to play the better football but spurned chances before Red Star scored a controversial third eight minutes from half-time. 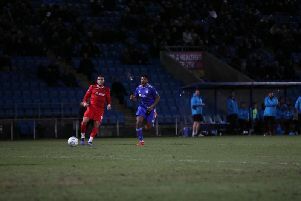 About 10 yards was “pinched” at a throw in, the ball landed in the area and Tom Barclay scored from close range, leaving the Rams’ players, management and supporters in a state of high dudgeon. The visitors hit back on 55 minutes when an excellent raking pass from Chris Gent found Calland who expertly teed up Ash Smee to apply a perfectly placed side-foot finish. Calland was dismissed for a second yellow card but the rams further closed the gap when Scott Singleton nipped between two defenders to convert Sam Gee’s low cross. A penalty for handball in the midst of a crowded goalmouth scramble enabled Cockroft to make it 4-2 and keeper James Bunn became the second Rams player to be sent off for inappropriate comments to the referee after the final whistle. A Danny Moralee hat-trick helped Denholme United move closer to the Division One title in a 6-0 home win over lowly AFC Crossley’s. Two more goals for Gary Ash, in Copley’s 3-1 home win over bottom side Calder ‘76 Reserves, helped his side’s promotion effort. Copley received a further boost when Brighouse Sports slipped badly away to Illingworth St Mary’s Reserves, who had appeared to have lost their early-season form. Man of the match Tom McGregor scored a hat-trick for Saints, who pulled clear after leading 3-2 at the break. Goals from Matthew Watson and Isaac Nichol were in vain as Ivy House lost 4-2 at home to Elland Allstars, for whom William Chappell scored twice. St Columbas’ promotion hopes in Division Two will be decided with four league games in eight days and they got the first one out of the way with a dominant 6-0 victory over Greetland Reserves. Saints played some excellent passing football on a heavy pitch and were rewarded with six different scorers. Frank Odion got the first with a classy turn and finish and Ryan O’Neill doubled the lead with a low left footed drive. Vinny O’Shea headed the next one before George Cook pounced on an error to make in 4-0 at half time. The pick of the goals came from Andy Sandells, who controlled and volleyed home a Ben Caldwell corner. Centre back Jacob Richardson rounded off the scoring with a glancing header. There was the same score at Midgley Rec where Midgley Reserves routed a much-weakened Northowram Reserves with the help of two goals from Jacob Dobson. Third-placed Junction Inn maintained their fine season with a 5-2 home win over Shelf United Reserves at Carr Green. Josh Norcliffe and Mark Wheelwright got what turned out to be consolation goals for the visitors. FC Ovenden could not raise a team for the only scheduled Division Three game away to Stainland United.